Salmon is on top of my favourite seafood list. It’s full of flavours and nutrients. I don’t need to worry about the calories or cholesterol intake, eat as many as I like, enjoy more frequently as I crave. The Asian flavoured salmon is my family’s choice just after salmon sashimi. 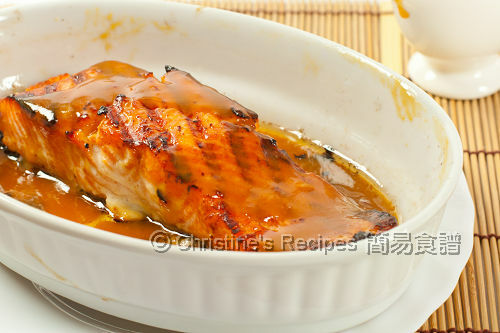 As a home cook, I love to bake salmon steak, with a bit of white miso paste by adding a subtle sweet flavour. This dish is simple and easy. Rinse the salmon and pat dry with kitchen papers. Scale and Debone. Mix with marinade well. Cover and put in fridge for at least 1 hour. Remove the salmon from fridge and place at room temperature for 5 minutes. Use a spoon to scrape away the marinade. Add 2 tablespoons of water to marinade and combine for later use. Heat oil in grill pan over high heat. Place the salmon on pan, the meat side first. Cook about 3 minutes until grill marks appear. Carefully turn and cook the skin side for 2 minutes. Transfer to the oven. (Note: if your grill pan is not oven friendly, transfer the salmon into a baking tray.) Bake for about 8 minutes, or almost cooked. Open the oven door, carefully pour the marinade mixture onto the surface of the salmon, continue to cook for another 5 minutes, or to your preferred doneness. As the marinade contains sugar, make sure not to burn the sauce while cooking. You’d taste bitterness otherwise. The cooking time depends on how thick your salmon is, and how well you like your salmon. If you don’t want to use oven, you can just grill or BBQ the salmon. Cook the marinade mixture separately. When you are ready to serve the salmon, top with the sauce. I had dinner the other day in a Japanese restaurant and we wanted to order the cod with miso but it was so expensive - am glad you posted the recipe - no need to pay for this in a restaurant anymore! :) Hope you had a good Christmas! Miso and salmon is so yummy. I am making salmon tonight but not with miso. Will have to remember this for another day. wow This looks truly to die for! Miso or teriyaki goes well with salmon. Yummy! I was looking for a swiss roll recipe and chanced upon your blog. Wonderful site with really good home-recipes! I eat Salmon all the time, so I have to try this one. I love salmon, too. I cook it very often. I often cook it with teriyaki sauce or hot bean paste. Would love to try with miso next time. Looks very delicious. Merry Christmas and Happy New Year! Sounds wonderfully flavorful with the miso marinade! Excellent preparation of salmon! This is an amazing reciepe for salmon! Seafood can be done in so many ways, but this is a refreshing taste to compliment the salmon with a mouth watering marinade! Christine, loving all your simple but delicious recipes, including this one. Wishing you a great new year ahead! That looks easy enought to replicate.. maybe I could do it :P Have a Merry NYE!!! Hi Christine, is the freshly grated ginger sauce from just grinding the ginger until it's pasty like the sesame seeds for the green beans? Thanks! What is freshly grated ginger sauce? Thanks! You can use a grater to make finely minced ginger, then squeeze the sauce out with your hand. Yes, you can, and feel free to adjust the amount. It looks amazing! It's very hard to find miso paste here though(Athens). Thanx for sharing! How's miso paste abd mirin look like? Here you can see the photos of miso paste and mirin .